This class is being rescheduled for early February. Please check back soon. If you sign up for our email list you will be informed of the new date. For well over a century, digestivos have been an integral part of the Italian food and drink experience. These herbal elixirs, known traditionally as amari, span the gamut from sweet and spicy to earthy and bitter. Recently, with the resurgence of craft cocktails and a new appreciation of heritage food and drink, these spirits have experienced tremendous popularity here in the states. While some might think of amari as simply a bitter shot you down to impress your friends or an ingredient used to add balance to a cocktail, most amari are surprisingly balanced and can be enjoyed on their own. We'd like to celebrate UpperWest's procurement of six new types of amari by offering this class. In the hour-long session, participants will have an opportunity to try seven types of amari. 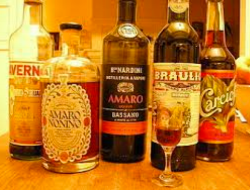 The class will begin with a brief background on amari, and participants will then have an opportunity to blind sample half ounce pours of each - noting aroma, flavor and mouthfeel. At the completion of the tasting, participants will share their notes before the identification of each amaro is revealed. Additional info on each will also be provided by the instructor, Damian Barneschi. Walk ins welcome, if seats are available.